Boy meets girl. Boy and girl get married. Boy and girl go to the kitchen and make sweet, sweet... food. 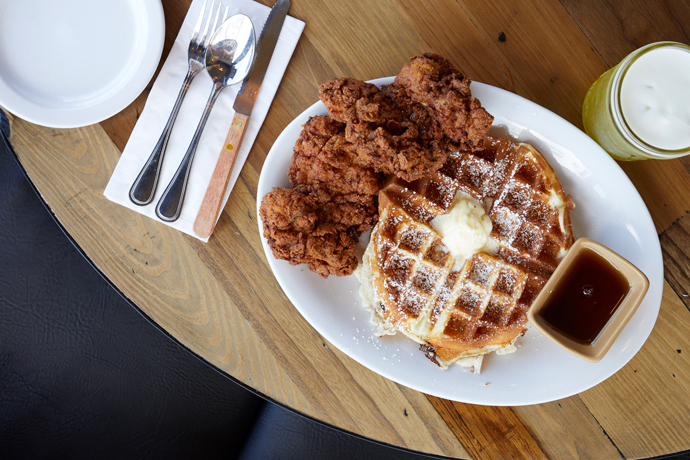 Boy and girl open pitch-perfect date spot in Hayes Valley. The end. Presenting Rich Table, a handsome new eatery from a husband-and-wife duo (that would be the namesake Riches), slated to open Thursday in Hayes Valley. There’s a real breezy farmhouse vibe happening here. You’ve got your rugged walls lined with wood salvaged from an old sawdust mill. Your light fixtures crafted from gas pipes. Your exposed steel beam holding everything together. If you’re here with a date (hint: come here with a date), hit one of the cocktail tables next to the bar by the window and summon drinks like the peaches/rye Barn Wood or the mezcal/ginger Big Night. If you’re here with a group (hint: come back with a group), go for the booth tucked in the back. And if you’re up for anything (hint: ... okay, you get the idea), try one of the two communal tables in the center and watch the chefs work their magic. Said magic: tomato-braised oxtail with charred octopus, executed with the precision you’d expect from Michael Mina/Coi vets. Oh, and a six-course tasting menu with things like caviar. And, like, five other things.